Dharamsala - McLeod Ganj, the seat of Dalai Lama’s Tibetan Government in Exile, on a selection of detailed street plans and satellite images of the whole area showing road access and locations of various facilities for visitors, temples, etc. 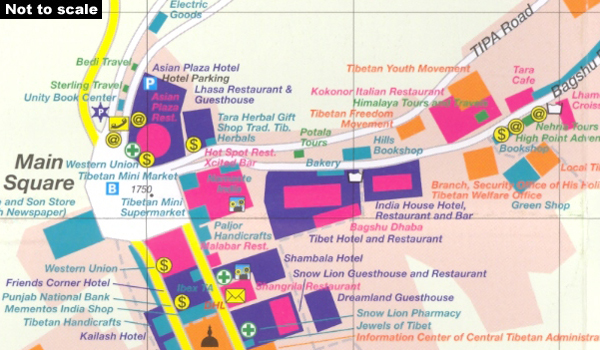 The main street plan covers McLeod Ganj Town at 1:1,700 showing various institutions and facilities for visitors colour-coded and with names. Also included are insets with similar plans of Bagshunag, Dharamkot and Gangchen Kyishong (all at 1:2,500) and Naddi (Talnoo) at 1:5,000. The institutions and facilities shown on the plans are listed in an index. A satellite image of the Upper Dharamsala at 1:5,000 indicates the areas covered by the street plans and shows road access plus various institutions and facilities in the areas not covered by the street plans. On the reverse, a similar satellite image covers a wider area, including Lower Dharamsala with the War Memorial and the Foreigners’ Registration Office. All names are in English. Map legend also includes German, French, Italian and Spanish. Also included are addresses of the International Campaign for Tibet, plus contact details of various Swiss and German institutions connected to the cause of Free Tibet.